Kodi awoke to the sound of a howl. He ran out side to if it was his dad and saw Dusty standing there. "Hey Dusty what are you doing here?" "I wanted to..ask you...if I could...be your..." She didn't finish. "Be my what?" Kodi asked beginning to feel lightheaded. "Can I be your mate?" Dusty asked. "I make sure your happy and I always love you." She added. "Dusty I'm always happy with you and I love you too." Kodi said nuzzling. "So is that a yes?" Dusty asked nuzzling back. "Yes." Kodi said smiling. Dusty smiled and put her nose to his. "Hey let's go tell my dad and mom." Kodi said returning the kiss. They ran off and came up onto Jenna's porch. Kodi barked and Jenna came out panting. "What's wrong mom?" Kodi asked. "I'm found out I'm pregnant with Balto's second litter." Jenna said calming herself down. "Did you tell him yet?" Dusty asked. "No he wanted to mate with me, but I'm not sure he wants more pups." Jenna said. Balto came up and said "Jenna are you pregnant?" "Yes." Jenna said. "Yes I'm a father again!" Balto said nuzzling Jenna. Dusty looked at Kodi and he said "Yes we can have pups." If you like that is." He added. Dusty nodded yes and they ran off. Balto and Jenna found out next day that Dusty was pregnant. Soon Balto and Kodi had pups running around ever were. "Hey Balto how do you be a good father?" Kodi asked while Dusty ask Jenna "How do you be a good mother?" "You'll do good." Both Balto and Jenna said. Soon though Peace one of Kodi and Dusty's pups fall for Max one of Balto and Jenna's pups. 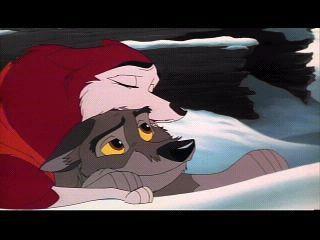 How can Balto, Jenna, Kodi, and Dusty tell them they can't be together?